More than 50 years ago, the sociologist James Coleman already noticed that pedestrians moving within small groups composed of two of three individuals are more frequent than people walking alone (although it depends on the social context). Can we make pedestrian simulations more reliable and more realistic by including social interactions among individuals? 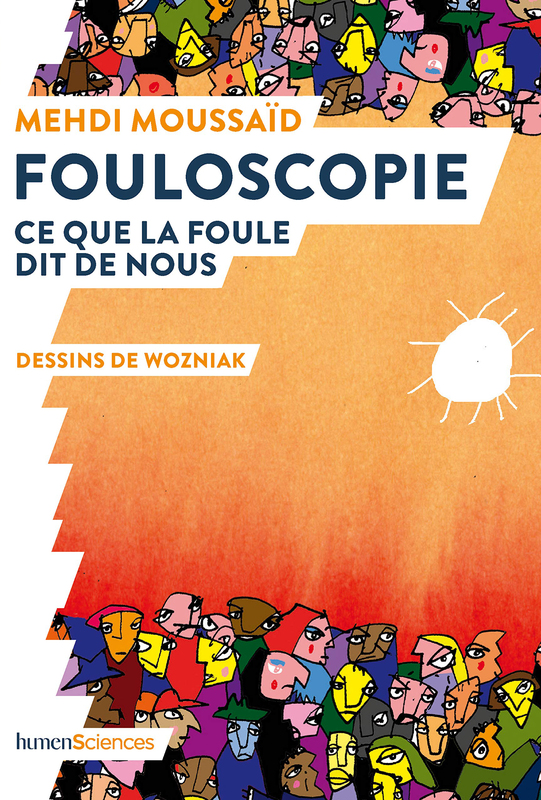 The starting point of this work is a set of video recordings that we made together with my frolleague (friend+colleague) Simon Garnier. 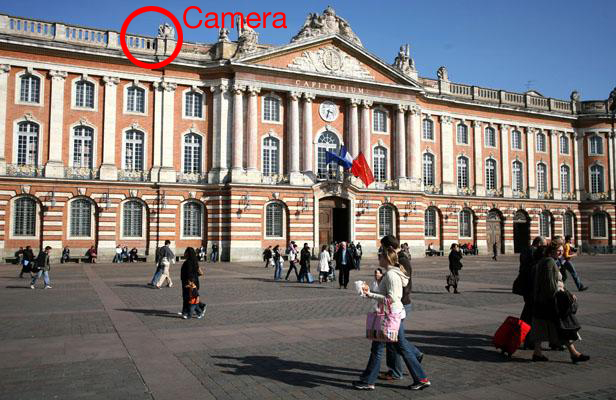 In order to have a nice point of view, we went on the roof of this nice building in Toulouse (which is nothing else that the city hall, a very nice place to visit by the way :)). 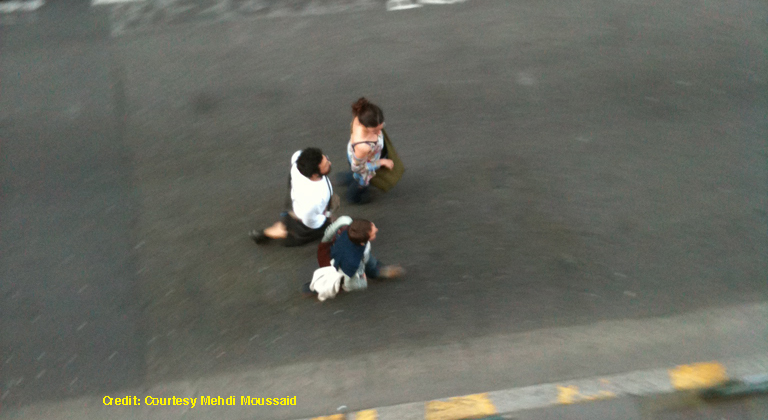 From there, we had a good view on the passers-by for our analyses. After hours of recordings, and additional painful days of manual tracking on the computer, we finally got this dataset of about 1500 moving pedestrian groups. In good agreement with Coleman’s findings, we measured that up to 70% of the pedestrians actually walk in small social groups, such as friends, couples, or familly members moving together. 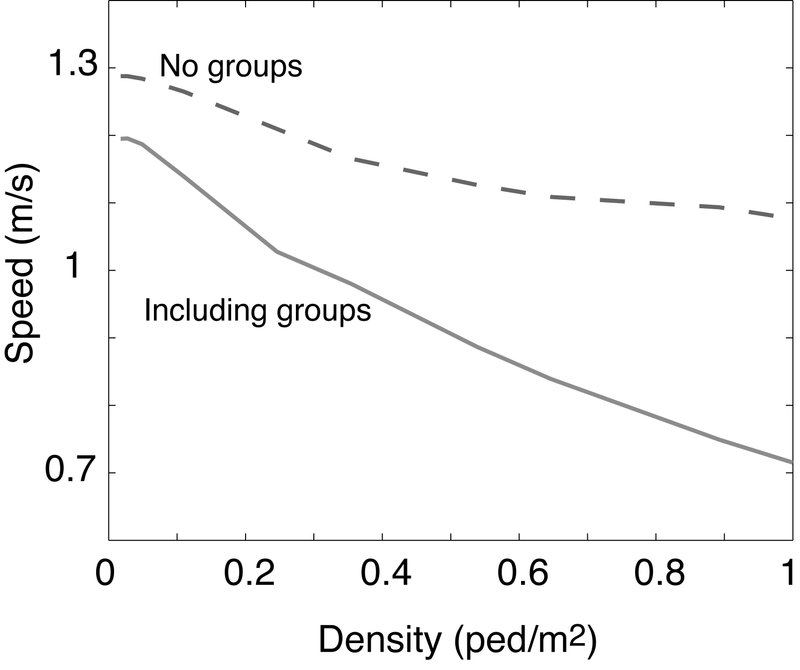 Group size vary from 2 to 4 persons, while groups of made of 5 members and more are rare. Moreover, further analyses have shown that these groups – technically called “medium-scale aggregated structure” 🙂 – have very specific walking configurations: At low density, group members tend to walk side by side, forming a line perpendicular to the walking direction. 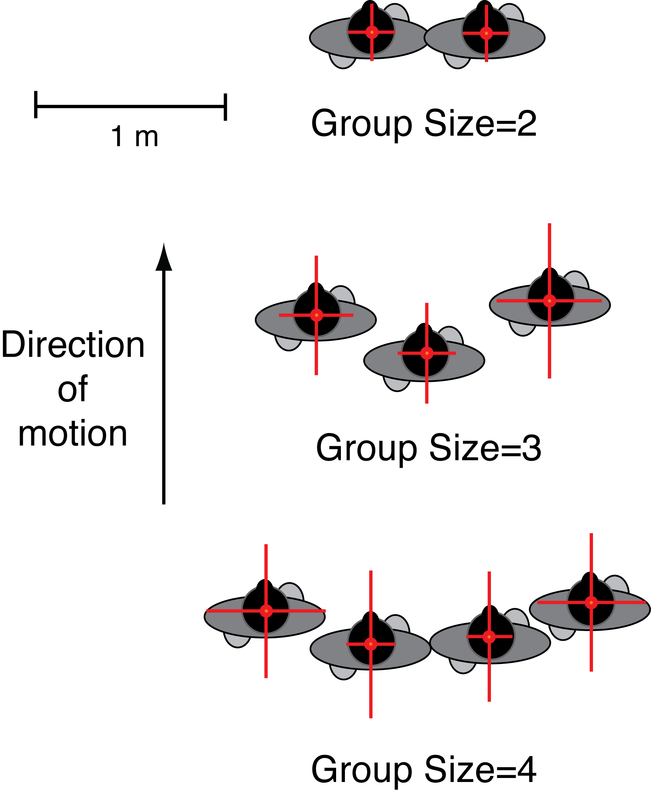 As the density increases, however, the linear walking formation is bent forward, turning it into a V-shapped walking pattern, where people in the middle of the group tend to move back and those on the side get closer to each other. So why do people deliberatly violate the laws of physics and break down 30 years of scientific work? Well, the answer is pretty simple. This is not about physics, this is about social interactions. People adopt a concave walking configuration because this is the only way for every group member to see all his friends with a simple head movement. Imagine that you are trying to talk to some friends located behind you.. That would be pretty unconfortable, obvisouly. Modelling this behaviour was rather easy. Assuming people have a 180° vision field, and can turn their head left and right (seems like a reasonable assumption…), then one very simple rule is enough to reproduce the observed V walking patterns: “If you can’t see your friends, slow down“. However, let’s come back to the physics of pedestrian flows. If the most efficient way to move ahead is the reverse-V walking configuration, then how bad is the observed V-shaped configuration? In fact, computer simulations taking into account pedestrian groups demonstrate that the traffic efficiency is actually decreased by an average of 17% as compared to a situation with isolated people only! Groups reduce the flow capacity… but at least now we can chat with our friends! The only solution to enhance the traffic efficiency without forbidding people to talk in the street is to provide pedestrians with larger sidewalks and a more confortable urban environment. One day maybe!